Image your day consisting of a 2.4-mile (3.86 km) swim, a 112-mile (180.25 km) bicycle ride and a marathon 26.2-mile (42.2 km) run. This is without breaks and all events must be completed in 17 hours. To participate you must have completed prior Ironman competitions under certain and strict guidelines. 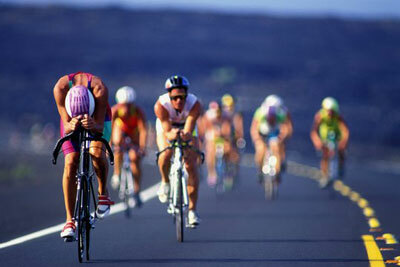 Welcome to the Kona Ironman, which is the world championship of all Ironman. TG is a patient who presented to Centeno-Schultz Clinic with the aim of successfully completing Kona despite ongoing knee pain. TG is 54 y/o avid athlete and professional with a 15 month history of right knee pain localized on the medial aspect without radiations and associated with limp and intermittent swelling. Treatment to date included unloader brace, steroid injection, PT, massage, trial of NSAID and two knee arthroscopies with partial resection of the medial meniscus. MRI was significant for mild scarring of the ACL, tear of the medial meniscus, partially extruded medial meniscus , edema in bone on medial femoral condyle and thinning of cartilage in medial and patella femoral compartment and laxity of MCL. Physical examination was significant for asymmetric calf girth, quadriceps weakness, decreased sensation in right big toes, laxity of the ACL and MCL( medial collateral ligament) and right knee swelling. x-ray guided prolotherapy of ACL and MCL. 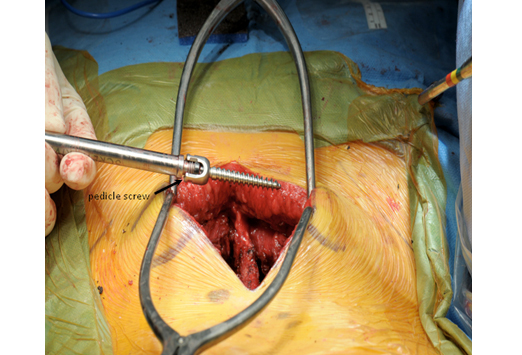 Prolotherapy of the supraspinous, intraspinous, and iliolumbar ligaments. Regenexx cSCP injected into ACL, MCL. One of TG’s largest concerns prior to the competition was his knee and he reports that he ‘had no problems”. We acknowledge all the time, hard work, commitment and dedication it took to qualify and complete in the Kona 2013 Ironman. Thank you for allowing Regenexx to assist you in achieving your goal. At the Centeno-Schultz Clinic we acknowledge and know first hand the pain, restriction in range of motion and erosion of well-being associated with low back pain. Previous blogs have discussed the clinical success of Regenexx PL in patients with lumbar disc disease and pain. Regenexx C when injected directly into the disc has been demonstrated to reduce pain, increase level of activity and has been associated with changes on MRI. Surgery in the form of lumbar fusion is the often held out by many as the answer. Is it an effective therapy for low back pain? No not according to Smith et al who examined this question. In a retrospective analysis they reviewed consecutive patients with back pain and concordant lumbar discogram who were offered fusion. 96 patients were examined: 53 who underwent fusion and 43 opted for non surgical treatment. Conclusion: no improvement in pain, health status, satisfaction, or disability was noted in patients who underwent lumbar fusion in comparison to those who had conservative care. Take away is that lumbar fusion is not the holy grail for low back pain. 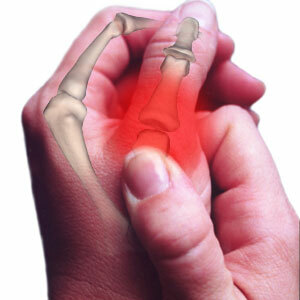 Exhaust all treatments and make sure that all possible pain generators are considered. These include myofascial, facet, SI joint, ligamental instability, nerve entrapment and intervertebral disc. At the Centeno-Schultz Clinic we acknowledge the significance of an ACL tear as it can lead to knee instability, cartilage and meniscus damage, ligament irritation and alternation in gait. In short, it can be a game changer. Stem cell treatment is an alternative to traditional ACL surgical repair. Previous success stories have been posted on patients who declined surgery and underwent stem cell treatment with Regenexx SD. BT is 19y/o college football player who tore his ACL and rejected surgery. 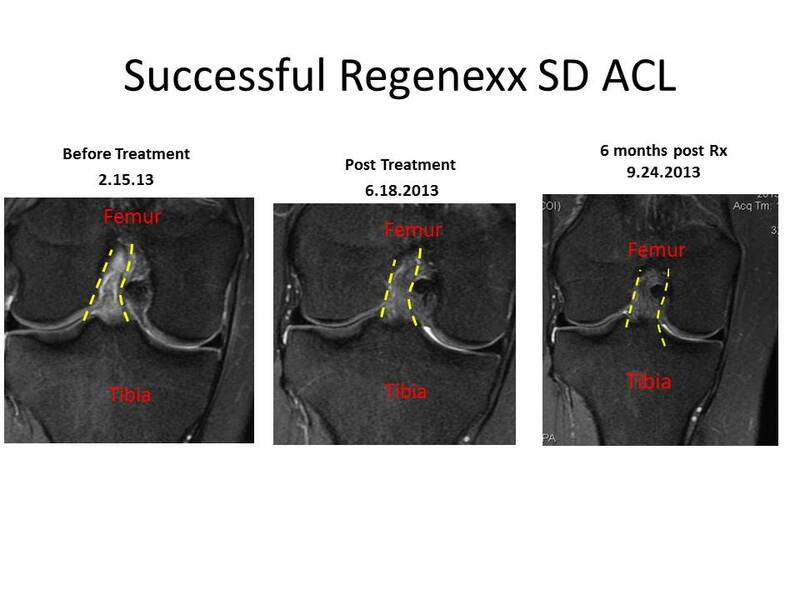 In November 2012 he underwent Regenexx SD where bone marrow derived cells were placed into the ACL. He had three post stem cell injections and a booster injection which contained SCP and PL. At follow up he had no pain, instability or restrictions. 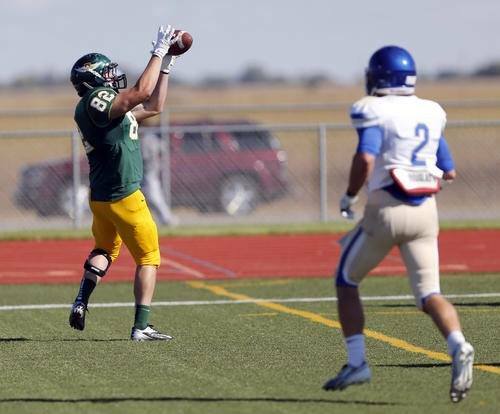 This week BT scored his first collegiate touchdown!!!! Congratulations B! MM is a 16 y/o athlete who torn her ACL and declined surgical repair. She opted for Regenexx SD where bone marrow derived stem cells along with platelets are utilized to repair injured tissue. 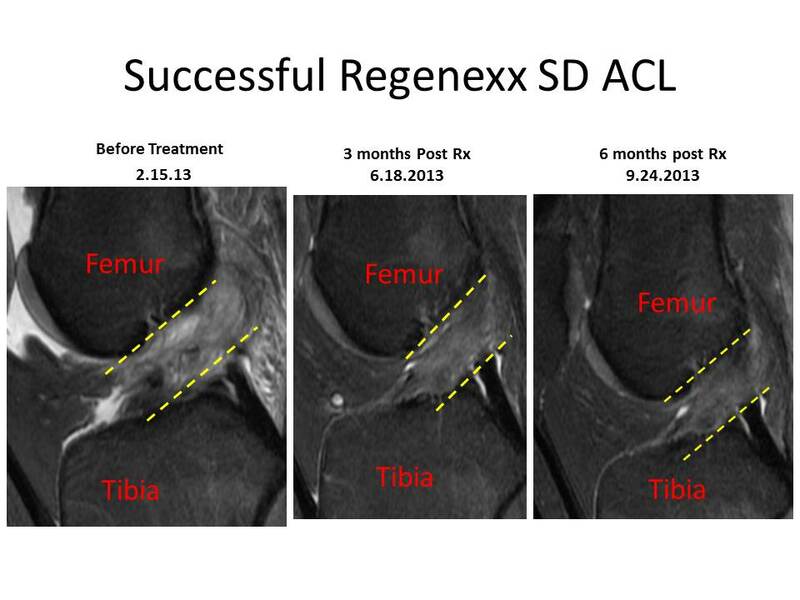 Regenexx SD has been used successfully in the treatment of ACL tears in other patients. MM tore her ACL in 2.2013 while playing soccer and underwent stem cell treatment in march 2013. MRI 3 months post Regenexx SD demonstrated improvement which corresponded with her signficant clinical improvement. Patient underwent x-ray guided injection of cSCP as a booster in July 2013. I recently reviewed new knee MRI which is 6 months post stem cell treatment. It demonstrates continued improvement and healing. Most importatly there is no ACL tear. MM is now active and without pain or instability. Below are the pre, 3 month and 6 month post Regenexx MRI’s. Note the serial improvement in the ACL fibers which are outlined in yellow. 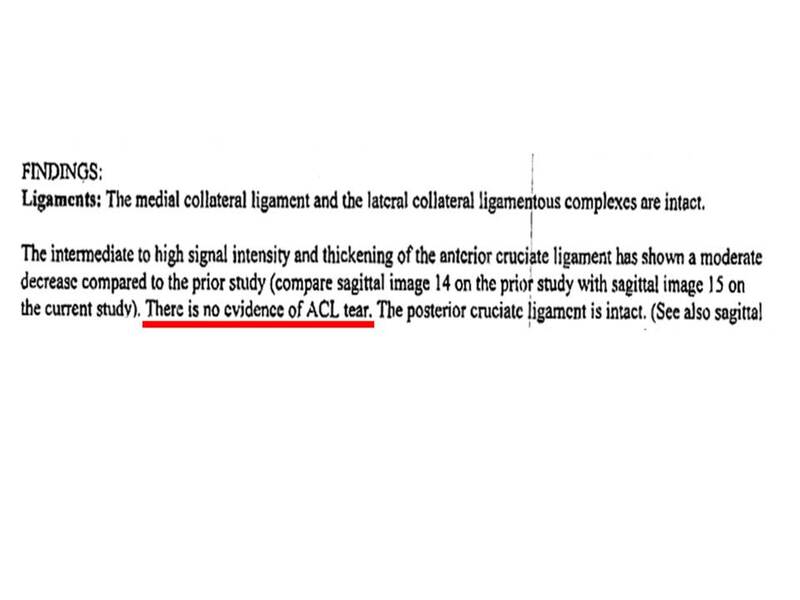 Most recent MRI report demonstrates no ACL tear. Congratulations to MM and her family who embraced stem cell therapy and avoided surgery. 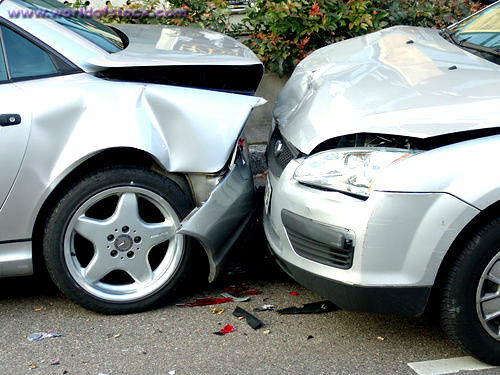 At the Centeno-Schultz Clinic we acknowledge the potential impact of motor vehicle accidents on a patient’s well-being. Rear end motor vehicle accidents can cause an acceleration deceleration injury to the cervical spine. Does head position at time of impact in a rear end MVA matter? Does it led to injury of specific areas? Panjabi examined these concerns in a 2006 study. He concluded that head-turned rear impact caused significantly greater injury at C0-C1 and C5-C6 facet joint, as compared to head-forward rear and frontal impacts which resulted in multiplanar injuries at C5-C6 and C7-T1. This is significant as the pain referral patterns are different as previously discussed. 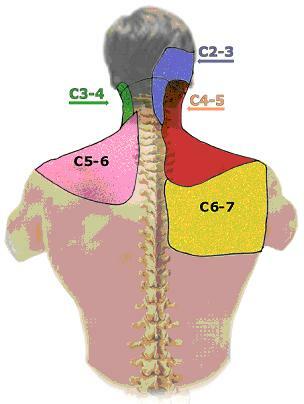 The C0-C1 facet refers to the suboccipital area whereas the C5/6 and C7/1 facets refer to the periscapular area. 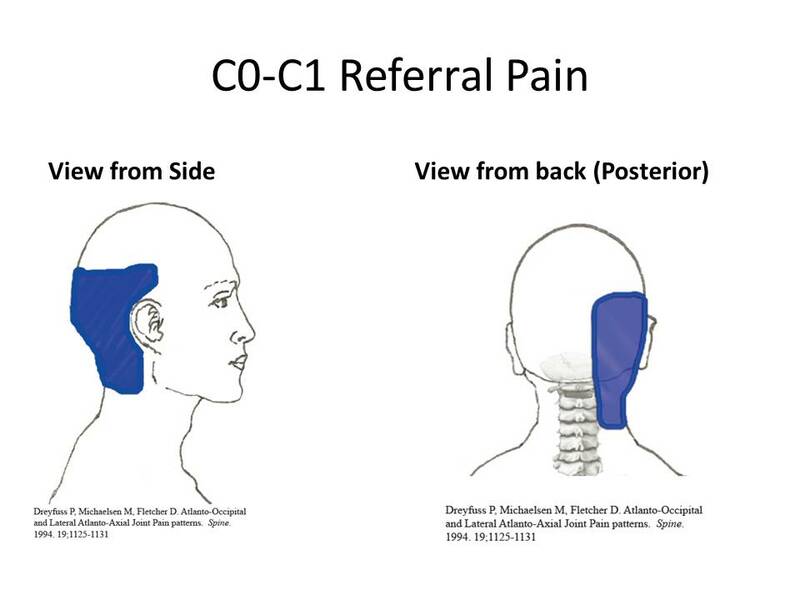 Periscapular referral pattern of C5/6 and C6/7 facet joint. Knowing the importance of head position in a rear end MVA is critical to understanding what areas are at greatest risk for injury and how best to treat them. This is standard of care at the Centeno-Schultz Clinic.